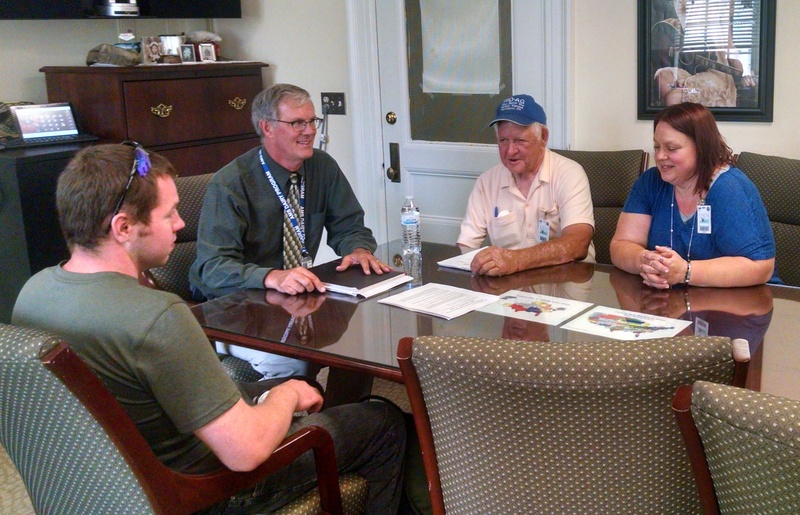 Several dairy farmers and staff of various farm organizations met on September 15, Thursday in Washington with officials of the USDA in meetings and events organized by Farm Aid. Introducing the events was the Farm Aid Executive Director, Carolyn Mugar. Attending the meetings included Kathy Ozer, Executive Director of the National Family Farm Coalition, Gene Paul (from Iowa) of the National Farmers Organization, a new staff member from Farmers Union, Arden Tewksbury of Pro-Ag, Joel Greeno with the Family Farm Defenders and ARMPPA, Carroll Wade of National Farmers Organization, and Robin and Justin Fitch of New York state who are also members of Pro-Ag. The meeting was held in conjunction with the annual Willie Nelson (and others) Farm Aid concert held in northern Virginia on Saturday. Willie Nelson, a famous country singer and composer, held his first Farm Aid concert in St. Louis, Missouri in 1985, and has been a strong supporter of all agriculture producers. According to Arden Tewksbury, Manager of Pro-Ag, the group had a 90 minute give-and-take exchange with USDA officials. They discussed various avenues that Secretary of Agriculture Tom Vilsack may or may not be able to take to help reduce the financial nightmare most dairy farmers are facing. 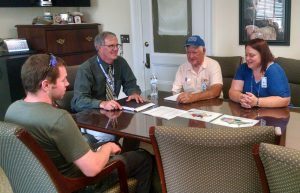 However, the group urged the Secretary of Agriculture to call an emergency national hearing so all dairy farmers would have an opportunity to speak their peace. Tewksbury also spoke about how the United States Congress had stripped the Secretary of Agriculture of various programs he could have used. This action was taken in the passing of the most recent Farm Bill. Robin Fitch revealed how the present financial situation may force her family to sell their dairy farm. Joel Greeno related how inadequate unstable prices forced him to sell his cows and take a job off the farm. Before the meeting concluded, Tewksbury passed out copies of the Federal Milk Marketing Improvement Act and a paper containing 18 points of the important parts of the bill. The Act, if passed, would price milk to dairy farmers based on the national average cost of production. The Act also calls for a milk supply management program geared to bring the supply of milk in line with the real market. Tewksbury concluded by saying the proposed Act, if implemented properly, could return the price paid to dairy farmers to between $23 and $24 per cwt. (hundred-weight, or 100 lbs. of milk ). This entry was posted in Blog, Press, Releases and tagged Cost of Production, Dairy, Fair Prices, Farm Aid, Federal Milk Marketing Improvement Act. Bookmark the permalink.